Fermentation Support Forum • View topic - Will I die? I've been looking to get into fermenting for a while but been scared to do it wrong and "die"! haha So I've finally decided to buy the Kefir grains and have been fermenting batches for the last week without much success. Just need some advice! The first 2 batches took like 2 days to ferment properly so the kefir smelt super sour and I threw it away. The third batch worked a bit better but I still had quite a lot of milk in the jar after 24 hours and I didn't want to leave it fermenting more time to avoid batch 1 and 2 experience. Didn't dare to drink it. 4th batch was better, he temperature in the house was higher so everything looked normal. There was still a bit of unfermented milk left in the jar but I strained it again, to avoid over doing it. I put the kefir in a bottle in the fridge and left it for another 8 hours (and is still there). How do I know my ferment is right though? It does taste/smell like supermarket kefir in a way but it is a bit more sour and fizzy (Also not as smooth, has a bit of a granular texture). Also at times it tastes like regular milk that's gone just a couple days past its expiry date (which is not really pleasant). So how do I know if I am drinking nice healthy kefir or if I am ingesting spoiled milk that's going to cause me an indigestion?!?! I only drunk a little bit and testing how it feels. Don't dare to drink it all! I dump some grain in a jar and add milk and leave it 24 hour until the liquid separates from the mixture. Then drink all that is strained out. 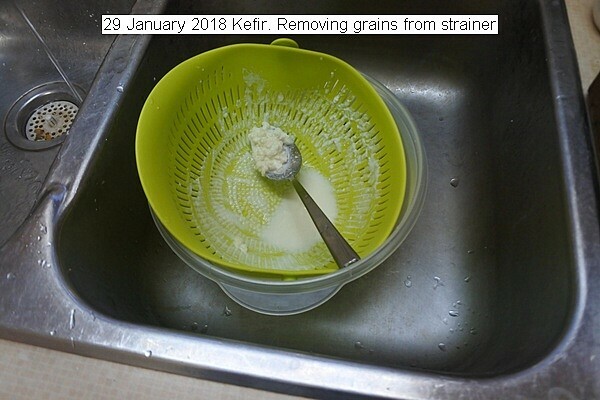 This is my chosen method to produce 500 ml of kefir daily. A new larger screen was selected, making straining the grains less onerous. The fermentation is slightly less than 24 hours at about 22 C.The strained kefir is allowed to age 24 to 48 hour at room temperature prior to ingesting. It can be a bit sour but want it for effect not particularly interested in the taste. As far as I know it is almost impossible to get sick on it from my experience. Some people don't ingest the liquid, I just drink all. Welcome to Wild Fermentation, Olivia. You may want to post in the dairy ferments board to get more eyes on your question.